FINALLY SOMETHING FOR THE LADIES! Please call or email to order! 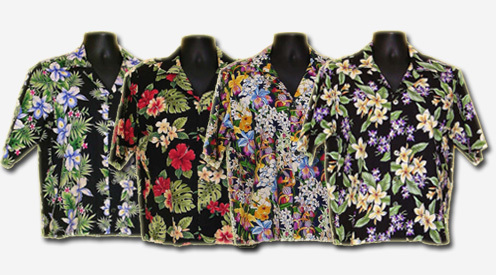 The ladies Hawaiian shirt is different from the men's style. 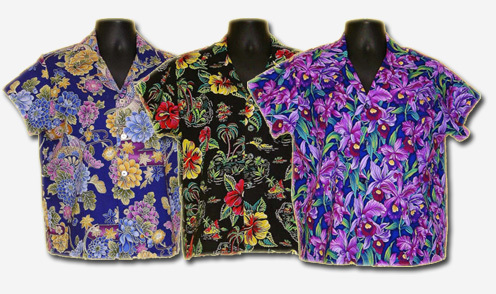 I use the same basic pattern so it still look like a casual Hawaiian shirt but I can shorten the sleeves or make them 3/4 length. I can also take in the shoulders a bit and shorten the lenth on them for the shorter ladies. I would like to ask a few questions before starting on a ladies shirt. They are a little more fitted for the female form and look more feminine instead of the baggy, casual look of the men's shirts. Since I started making these more fitted shirts for myself, I wear them all summer long with mini skirts and pedal pushers. BANDANAS AVAILABLE in any of our 200+ fabrics for only $5.95.